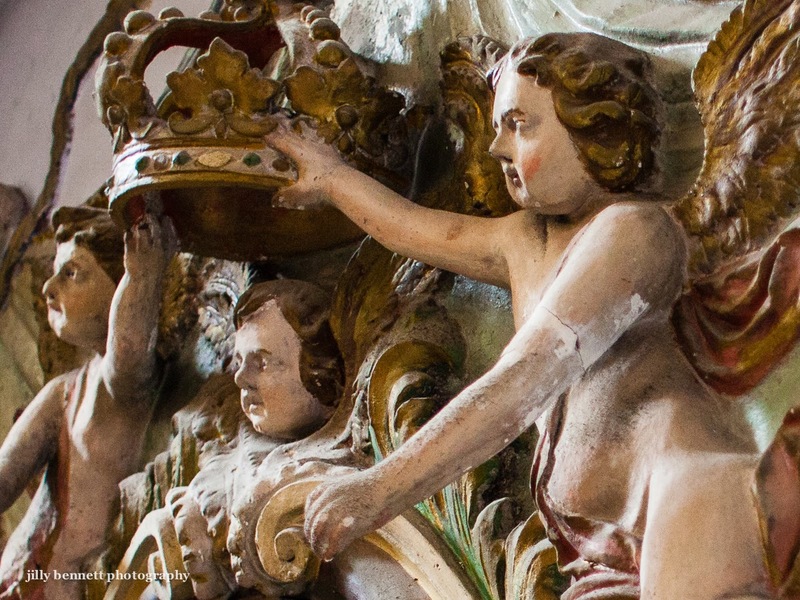 Cherubs in Gorbio's Church of Saint Barthelemy. Chérubins dans l'église Saint Barthélemy de Gorbio. I was away in Ethiopia for 3 weeks, so I am just now catching up with your blog. Great photos recently, as always. Your post the other day about photographing people under umbrellas reminds me of an incident that happened at a tribal village in Ethiopia. Several of the bare breasted dancers crowded around me, attracted to my umbrella, as it had started to rain. I held he umbrella with one hand and took a photo of them under the umbrella with the other hand. But they look so bored, little functionaries at work. Love this photo, Jilly. And Bob's comment, too! Excellent. I like seeing this up close.